Great way to use can pumpkin! I am always looking for ways to get extra protein into my boy's bodies. Since I try to feed my family a meatless diet, I find that getting protein into my youngest two can be a challenge as they are still expanding their palate. The boys don't care for beans, tofu or eggs for protein sources and it seems that the only protein that they will eat is peanut butter, nuts, and nut milk. While those are great protein sources, I know that my boys could use more protein. So I like to use protein powder to supplement their diet. The boys don't care for protein shakes so I like to use the protein powder in my recipes. One of the boy's favorite healthy recipe is protein pancakes. I like to make different flavors of pancakes for the boys. 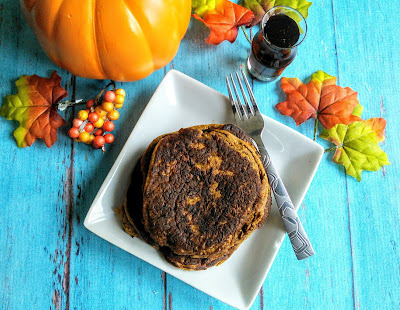 This week I decided to make pumpkin pancakes as I was craving pumpkin pie. The fall weather always leaves me craving pumpkin. These pancakes are so easy to make and taste great with a bit of syrup. I like to double the recipe so the boys can snack on the pancakes or make peanut butter sandwiches with them. These healthy pancakes are loaded with protein and vitamin A. If your kids like chia seeds, then add 2 tablespoons to the recipe for omegas and some fiber. I found this recipe on the Previnex blog website. This website has some other great recipe ideas for breakfast that includes Protein Coffee Latte. These breakfast ideas also make great snacks. Pour rounds of batter onto the skillet, and cook until bubbles on the surface and then flip with a spatula and cook for another 2-3 minutes. Notes: Oat flour is so easy to make. Just place oatmeal in a high-speed blender and mix until flour texture. 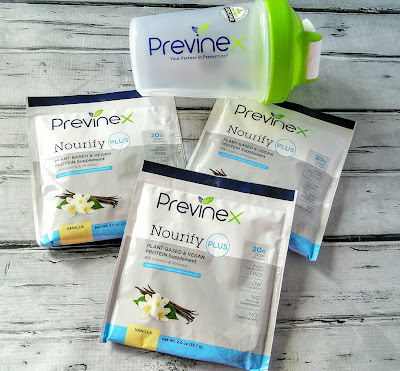 I received samples from Previnex to facilitate this post.